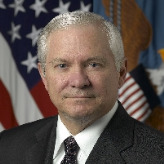 A native of Kansas, Robert M. Gates served as the Secretary of Defense from December 18, 2006 until July 1, 2011. Gates received his bachelor’s degree in 1965 from the College of William and Mary, his master’s degree in history in 1966 from Indiana University and later his doctorate in Russian and Soviet history from Georgetown University in 1974. In 1967 he was commissioned a second lieutenant in the US Air Force and served for a year as an intelligence officer at Whiteman Air Force Base in Missouri. In 1969 he joined the Central Intelligence Agency (CIA) as an intelligence analyst. Gates left the CIA in 1974 to serve on staff of the National Security Council. He returned to the CIA in late 1979, serving briefly as the director of the Strategic Evaluation Center, Office of Strategic Research. He was named the director of the DCI/DDCI Executive Staff in 1981 and Deputy Director for Intelligence in 1982. From 1986 to 1989, he served as Deputy Director of Central Intelligence. In 1987 Gates was nominated to become director of the CIA, but withdrew his name after it became clear the Senate would reject the nomination due to his role in the Iran-Contra controversy. From 1989 to 1991, he served as assistant to the President and Deputy National Security Adviser for President George H.W. Bush. Despite the earlier concerns about his role in Iran Contra, Gates did become director of CIA in 1991, making him the only career officer in CIA history to rise from entry-level employee to director. He headed the CIA until 1993. That same year the final report on the Iran-Contra investigation was issued. It said Gates was “close to many figures” who played significant roles in the scandal, and that he was “in a position to have known of their activities.” But there was not enough evidence to warrant an indictment against Gates. From 1993 to 1999, Gates worked as a university lecturer at numerous schools and published his CIA memoirs, From the Shadows: The Ultimate Insider's Story of Five Presidents and How They Won the Cold War. He served as interim dean of the George Bush School of Government and Public Service at Texas A&M from 1999 to 2001. Gates became president of Texas A&M University in August 2002. Gates was President George W. Bush’s first choice to serve as secretary of the newly established Department of Homeland Security, but Gates chose instead to remain at Texas A&M University. It was also rumored that Gates was President Bush’s pick to become the first director of National Intelligence. Until becoming Secretary of Defense, Gates served as chairman of the Independent Trustees of The Fidelity Funds, the nation’s largest mutual fund company, and on the board of directors of NACCO Industries, Inc., Brinker International, Inc. and Parker Drilling Company, Inc. He also served as a member of the Iraq Study Group, the bipartisan commission co-chaired by James A. Baker III and Lee Hamilton examining the war in Iraq. The final report of the group recommended a withdrawal of US troops from Iraq and the gradual turning over of security responsibilities to Iraqi military forces. Instead of following this recommendation, Gates oversaw the troop surge ordered by President Bush that added another 20,000 soldiers in Iraq.